Are you looking for an amazing costume for Halloween, or even just a fun party? Have I got the opportunity for you! 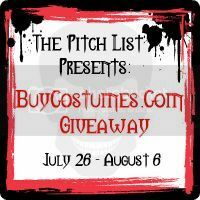 We are teaming up with a fantastic group of bloggers, along with BuyCostumes.com to give you a chance at SEVEN costumes! That is right, there are SEVEN costumes up for grabs and you might be lucky enough to snag one for yourself! If you are interested in seeing pictures and hearing reviews of some of these amazing costumes, check out the linky below to visit the participating blogs and read their wonderful reviews. Here at The Mommy Bunch we will be receiving a costume shortly and will have a review posted for you once we get it, but in the meantime go ahead and enter to win a costume of your own!